One of my newest Sunday rituals is to cook several days worth of meals so that I can get through most of the week without having to worry or find time to make lunches and dinners for Liz and me. It's a helpful on several levels, preparedness for healthy meals and Weight Watcher's friendly eating and quick grab things to take when there's no time to cook. Because I work late on Mondays and then go to WW and the gym, I'm not home until after 9 pm, leaving me exhausted and without any energy to think about cooking something for that night or the next day. This past Sunday was another marathon round of baking, cooking, soup making and food photo opportunities. I made the above soup, a curried split pea, fully vegan/vegetarian and ready to take to my kosher office. I also made, but won't be taking to work, grilled chicken and a strip steak; kosher office-friendly mustard crusted baked salmon; sweet potato oven fries; pumpkin quick bread; string beans; sauted zucchini, squash, red peppers and chick pea medley; and Irish Oatmeal with pumpkin for breakfast. I'd rather cook a lot over several hours and have it done than to have to figure out what to make on daily basis. I love the choices and the mix and match efforts. If I make too much of something, I usually freeze a portion or two. In a few weeks or months, I can pull out a container of my favorite church supper casserole or pint of Miso soup and I'm set. 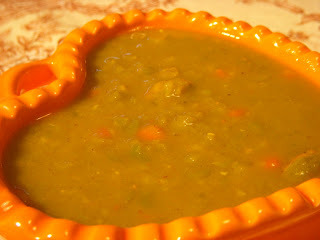 As promised in my previous post, I am writing the recipe for the split pea soup. My intention was to make a vegetarian version; lighter, cheaper and kosher-friendly for my job. Perusing the new Martha Stewart cookbook - Martha Stewart's Cooking School, I discovered her Indian/Curried version. In true Martha Stewart fashion, it's a bit more involved than I wanted but the idea was splendid. The recipe builds up a great base layer of flavors so you won't have to worry about having a pre-made stock of any kind or a ham hock or smoked turkey wing to use for flavorings. I like to saute my mire poix just to the point of where it starts to caramelize - bringing out the golden hues and sweeter flavors of the onion, carrot and celery. Dried peas tend to have an earthy and smokiness to them already; the curry powder marries well with those flavors and brings it's own earthiness. These ingredients can be found in your average supermarket. For best flavors, use a mild to medium curry powder that's not too old - remember, ground spices have less than a 1 year shelf-life. For those of you who know me well, I use a curry blend from Penzey's if I'm not making my own. In a large stock pot, heat the oil over medium heat until it shimmers. Add in the onions, carrots and celery and saute until the onions take on a light golden color and the carrots are knife tender - about 10 minutes. Add in the minced garlic and ginger and saute for 1 minute. Add in the curry powder to toast and bring out the curry's fragrance and flavor - 1 minute. Pour in the 6 cups of cold water and the split peas, stirring to combine all of the ingredients in the stock pot. Bring the mixture to a gentle boil then reduce to a simmer, allowing the soup to cook for 45 minutes to one hour. Keep a lid lightly covered on the pot to keep the water from evaporating too rapidly. Check and stir the mixture every 10 minutes. One the soup has cooked for at least 45 minutes, add 1 teaspoon of salt and a few grinds of black pepper; stir to combine. 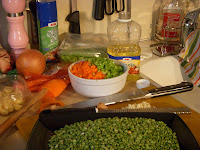 The soup is done once the peas have disintegrated and the body of the soup is thickened. Taste the soup, adjusting the seasonings, adding more salt, pepper and curry powder if needed. The peas should have melted and no longer be whole or al dente. Makes 8 portions. Serve hot. Hello! Thanks so much for your nice comments. I am not a photographer at all - I just have an old digital and experiment a lot. I did some reading on food photography and just play around. Same with cooking - lots of reading and experimenting, although I'd love to take a class someday. Looking forward to more of your posts and pics!